Getting shredded doesn't have to mean losing the muscle you worked years to build. Here are 9 strategies to help you keep the bulk. When you work incredibly hard to achieve a goal, it means a lot to you. Think about all those years you spent toiling in the gym in the name of adding muscle. Over time, that adds up to a tremendous amount of work—and bulk. There's no way you'd consider giving those gains in muscle back! But that may inadvertently be what you're doing when you chisel your body fat in pursuit of a rock-hard physique. When you're following a calorie-restricted diet to get super-lean, it takes an incredible balancing act to maximize fat loss while simultaneously minimizing muscle loss. We can tip the scales in your favor to allow you to hold on to your muscle mass by following a few important training and nutrition tips during a shredding phase. Nothing seemingly says success faster than seeing a big drop in pounds on the bathroom scale. Yet that's likely a warning sign you're losing substantial muscle and body fat. "To minimize loss of lean tissue when following a calorie-restricted diet, you can safely aim to lose 0.5-1.0 percent of your body weight per week," says Bodybuilding.com nutrition editor Paul Salter, MS, RD. "This equates to 1-2 pounds per week for a 200-pound person. Steeper drops in weight are most likely costing you muscle tissue." When dieting, a good place to start is determining how many calories and macros you need in order to place yourself in a calorie deficit. A popular and convenient approach is to start with an online fitness calculator that estimates total daily energy expenditure (TDEE). This simple-to-use calculator requires you to provide some basic information: your size, exercise habits, and goals (input fat loss to match your goal for this program). It then estimates the number of calories (and macros) per day to help you reach that goal. Weigh yourself frequently so you can monitor your progress and make necessary adjustments. "If your weight isn't trending downward, you're not in a deficit," says Salter. "However, if you drop a few pounds in the first 7-10 days (partly because of water loss that first week), you're right where you want to be." Continue with this plan until your weight hits a plateau. At that point, reduce your calories by another 10-20 percent to recreate a calorie deficit. In the calculations above, calories from fat and carb sources dropped, but protein intake increased. That's not accidental. The additional bump in protein shouldn't come at the expense of knocking yourself out of a caloric deficit. You must compensate by reducing carbs, fat, or a combination of both to maintain your deficit. Because you're cutting one of your body's main fuel sources, carbs, so significantly, your energy may quickly sag. But you still have to make a hearty effort in the gym. One smart strategy to maximize gym performance and recovery among calorie-restricted lifters is to ensure both the pre- and post-workout meals contain a majority of your day's carbs. That will help fuel your workouts and restock spent muscle glycogen. High-fiber, nutrient-dense carbohydrates like brown and wild rice, quinoa, whole-grain breads, whole-wheat pasta, beans, legumes, fruits, and vegetables should make up the majority of your choices throughout the day. These digest slowly and will provide you with long-lasting energy that fuels you for a great workout. If your pre-workout meal lies within an hour of your training, however, you may benefit from a faster-digesting option to ensure you crush your training without any accompanying GI distress. If you're going to opt for a fast-digesting carbohydrate at any other time of day, post-workout is the time to do it, to help rapidly replenish muscle glycogen stores. Keep in mind, however, that this rapid digestion may leave you feeling hungrier sooner than you hoped. The biggest fear among lifters who diet is a loss of muscle mass and strength, so set up your training to prevent this from happening. First, load up your workouts with multijoint exercises, where multiple joints are working in unison. Unclear about which is which? Multijoint exercises include squats, bench presses, rows, overhead presses, pull-downs, and the like. Single-joint exercises include flyes, lateral raises, curls, leg extensions, leg curls, push-downs, and similar movements in which movement takes place at only one joint. You're also able to push far heavier loads when using multijoint movements. Doing so triggers the release of anabolic hormones that can have a tremendous effect of muscle gain and fat burning. That doesn't mean you should avoid single-joint movements. And for all practical purposes, that's almost impossible to do with shoulder, biceps, and triceps workouts. But keep the focus on multijoint moves. There's a misconception that doing more work in the form of high reps is your ticket to burning more calories on a given set. The problem is that you'll have to back off on the load, and in doing so, you'll start to lose the strength-and-size-building stimulus. Muscle growth is optimized when you choose a load that causes you to fail at 8-12 reps. Strength is maximized when you choose an even heavier load that causes failure at 1-6 reps. When you do 25 reps with a fairly light weight, the emphasis shifts to building muscle endurance. This quality makes a muscle more aerobically efficient, but it has little effect on building muscle size. While your goal here is to maintain muscle and strength as much as possible when dieting, nothing causes atrophy faster than taking your foot off the muscle-building stimulus. At least toward the beginning of your training session, when you aren't fatigued, provide that stimulus by choosing moderate to fairly heavy loads. Research shows that training with heavier weight (around 6RM) helps you burn calories at a higher rate (above normal resting levels) longer than using lighter loads. Here's a recipe you'll want to avoid: long, drawn-out workouts combined with a calorie-reduced diet. Otherwise, you'll make the acquaintance of the hormone cortisol. While the hormone testosterone is linked to anabolism (muscle building), cortisol is instead linked to its counterpart, catabolism (muscle loss). Imperfect estimates say to cap workouts at an hour in length. That's unproven, but we do know the longer you train hard, the more your cortisol levels increase. Isn't that a Catch-22? Longer workouts increase total calories burned, but they also increase cortisol, contributing to muscle loss. The key is to minimize downtime, especially between sets, by completing more work done in the same amount of time. Enter set-extending techniques. With dropsets, you reduce a working weight by about 25 percent when you reach initial muscle failure and quickly continue the set. With supersets, you pair two exercises back to back with no rest period between them. 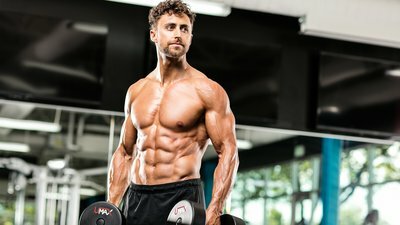 You can even try density training, a technique in which your between-set downtime is replaced by low-intensity activity to keep your heart rate revved and help you burn more calories without affecting the main movement. Such techniques intentionally creep into your rest periods, which can affect your strength levels. But if you save them for the latter half of your training session. you can still get a substantial strength stimulus early on. A well-thought-out plan beforehand is essential for maximizing your results. Your prescription for taking off the last few pounds of body fat may include additional cardio activity. Choosing the right type, then, becomes more than a choice of opting for the elliptical over the treadmill or bike. Low-intensity steady-state cardio was once the choice for precontest bodybuilders, and they often did it for hours a day. Now, something called high-intensity interval training (HIIT) is all the fat-burning rage. In a typical HIIT session, you would alternate periods of max effort with backing-off periods. A typical ratio would be 1:4; for example, 15 seconds of max effort followed by 60 seconds of backing off. HIIT boosts your metabolism (meaning you're burning more calories) not just during your training session, but also for as long as 24 hours afterward (called excess post-exercise oxygen consumption, or EPOC). That means the cumulative calories you burn keep adding up all day long. HIIT is already showing a number of advantages in the lab, namely an improvement in body composition (decreases in fat mass, increases in lean mass). That's on top of improvements in cardiorespiratory fitness, exercise performance, and insulin sensitivity, all of which are good things if you're worried about heart disease and and type 2 diabetes. Thus far, the discussion has covered some unsettling concepts: fatigue, low energy, crammed workouts, even muscle catabolism. No one ever said the process would be easy. So let's consider how a few supplements can make a difference. Knowing how important protein is to a shredding phase, start with a quality whey protein. Whey stimulates muscle-protein synthesis and slows protein breakdown. Increased protein consumption is also associated with higher rates of satiety (feeling of fullness) and thermogenesis (energy expenditure). If you're looking for an effective pre-workout supplement, make sure it contains caffeine. Studies have shown caffeine-containing supplements may improve the rate of fat breakdown and reduce perceived exertion during exercise. [7,8] Moreover, green tea extract—specifically EGCG, the primary ingredient in green tea extract—helps boost metabolic rate. The combination has been shown to be more effective for fat loss and increased energy. Some types of fat, like fish oil, can help you lower body fat while increasing fat-free mass.[11,12]. There's even some research to suggest that supplementing with omega-3s can increase rates of protein synthesis, leading to muscle gain. Another smart addition is beta-alanine. During exercise, hydrogen ions accumulate because of the increased intensity of your workout, which decreases your blood's pH levels and contributes to fatigue. Carnosine, a dipeptide molecule that beta-alanine helps to produce in your body, serves to buffer hydrogen ions. Supplementing with beta-alanine increases carnosine levels and allows you to work at higher intensity for longer periods of time. Highly charged gym sessions. A more challenging approach to cardio. A calorie-restricted diet. Suddenly, your body is walking a fine line between fat loss and losing muscle that took a long time to build. That's why adequate recovery becomes so important. Downtime from physical activity can help suppress cortisol levels, so getting a full night's sleep is especially essential. What's a full night? About 8 hours is still a good benchmark. Recharging each day can not only help recharge your internal batteries, but refresh your mind so you're ready to give maximum effort one day after another. And that's how your battle to get shredded will be won, and it won't mean sacrificing muscle in the process! Butterfield, G. E. (1987). Whole-body protein utilization in humans. Medicine and Science in Sports and Exercise, 19(5 Suppl), S157-65. Hill, E. E., Zack, E., Battaglini, C., Viru, M., Viru, A., & Hackney, A. C. (2008). Exercise and circulating cortisol levels: the intensity threshold effect. Journal of Endocrinological Investigation, 31(7), 587-591. Gillen, J. Low-volume, high-intensity interval training: A practical fitness strategy. WellSpring, 23(4). Frestedt, J. L., Zenk, J. L., Kuskowski, M. A., Ward, L. S., & Bastian, E. D. (2008). A whey-protein supplement increases fat loss and spares lean muscle in obese subjects: a randomized human clinical study. Nutrition & Metabolism, 5(1), 8. Costill, D. L., Dalsky, G. P., & Fink, W. J. (1977). Effects of caffeine ingestion on metabolismand exercise performance. Medicine and Science in Sports, 10(3), 155-158. Arciero, P. J., Bougopoulos, C. L., Nindl, B. C., & Benowitz, N. L. (2000). Influence of age on the thermic response to caffeine in women. Metabolism: Clinical and Experimental, 49(1), 101-107. Nagao, T., Hase, T., & Tokimitsu, I. (2007). A green tea extract high in catechins reduces body fat and cardiovascular risks in humans. Obesity, 15(6), 1473-1483. Thielecke, F., Rahn, G., Böhnke, J., Adams, F., Birkenfeld, A. L., Jordan, J., & Boschmann, M. (2010). Epigallocatechin-3-gallate and postprandial fat oxidation in overweight/obese male volunteers: a pilot study. European Journal of Clinical Nutrition, 64(7), 704-713. Hill, A. M., Buckley, J. D., Murphy, K. J., & Howe, P. R. C. (2007). Combining fish-oil supplements with regular aerobic exercise improves body composition and cardiovascular disease risk factors. The American Journal of Clinical Nutrition, 85(5), 1267-1274. Noreen, E. E., Sass, M. J., Crowe, M. L., Pabon, V. A., Brandauer, J., & Averill, L. K. (2010). Effects of supplemental fish oil on resting metabolic rate, body composition, and salivary cortisol in healthy adults. Journal of the International Society of Sports Nutrition, 7(1), 31. Smith, G. I., Atherton, P., Reeds, D. N., Mohammed, B. S., Rankin, D., Rennie, M. J., & Mittendorfer, B. (2011). Omega-3 polyunsaturated fatty acids augment the muscle protein anabolic response to hyperinsulinaemia–hyperaminoacidaemia in healthy young and middle-aged men and women. Clinical Science, 121(6), 267-278. Harris, R. C., & Stellingwerff, T. (2013). Effect of beta-alanine supplementation on high-intensity exercise performance. In Limits of Human Endurance (Vol. 76, pp. 61-71). Karger Publishers.